Physiologic instability (PI) is a common, critical problem in the emergency department (ED) [1, 2], and can have different underlying causes. The ability to determine the underlying cause of instability is paramount for early treatment and risk stratification . Lactate has been shown to have prognostic value in some categories of unstable patients [4, 5]. The objective of this study was to investigate how serum lactate concentrations differ across categories of PI and the association of lactate concentrations with clinical deterioration for each category. A prospective observational study of adult patients with PI at a university ED. PI was defined as lactate ≥4 mmol/l, or >5 minutes of heart rate (HR) ≥130, or respiratory rate (RR) ≥24, or shock index ≥1, or systolic blood pressure ≤90 mmHg. We excluded patients with no lactate measurements, isolated atrial tachycardia, seizure, intoxication, psychiatric agitation, or tachycardia due to pain. A physician retrospectively categorized PI cause. Categories were defined as septic, cardiogenic, hemorrhagic, hypovolemic, or other. The primary outcome was deterioration, defined as: acute renal failure (elevated creatinine to ≥2× baseline levels), intubation, vasopressors, or in-hospital mortality. We identified 1,156 patients with PI and excluded 324. 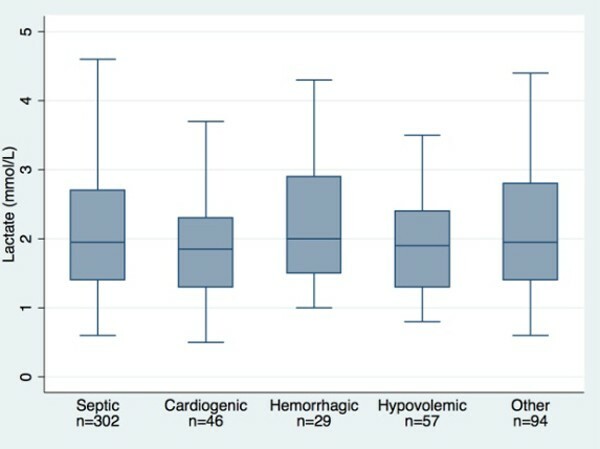 Of the remaining, 304 did not have lactate measurements, leaving 528 for the analysis: 302 septic, 46 cardiogenic, 29 hemorrhagic, 57 hypovolemic, and 94 with another cause of instability. The differences in lactate levels between groups were not statistically significant (Figure 1). 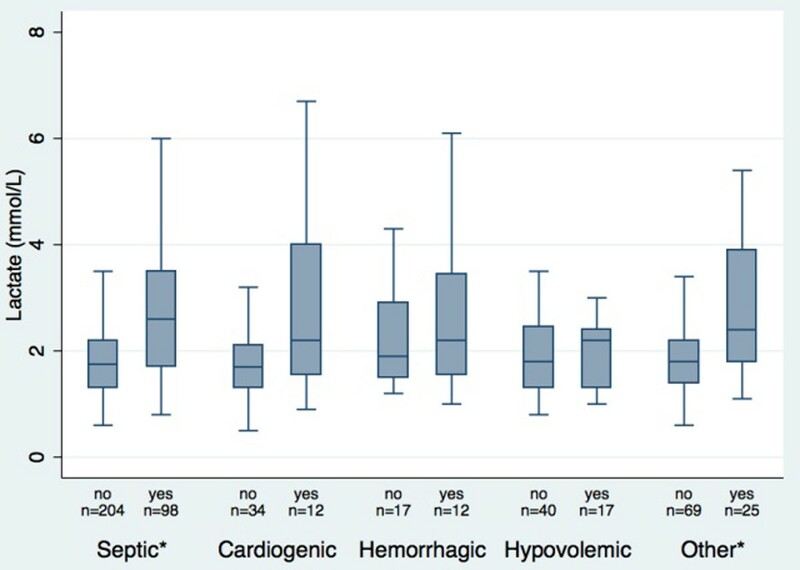 The lactate levels were statistically different between patients who deteriorated when compared with patients who did not deteriorate in the sepsis group (3.05 mmol/l vs. 1.91 mmol/l, P < 0.0001) and the other group (2.89 mmol/l vs. 1.94 mmol/l, P = 0.002). No statistically significant differences were demonstrated for the cardiogenic, the hemorrhagic or the hypovolemic groups (Figure 2). Lactate levels across groups of physiological instability. Levels of lactate across groups of physiologic instability stratified by deterioration. no/yes = deterioration present or not. (*) Significant differences between groups (p < 0.05). Lactate levels were not significantly different between the five groups with PI. However, in patients in the sepsis or other group, elevated lactate predicted deterioration. This was not demonstrated for the other causes of PI. This study suggests that in unstable patients lactate has the same likelihood of elevation between different causes of instability, but it may not have the same prognostic value for deterioration across underlying causes. CONSIDER Sepsis Network is a collaboration of clinical researchers with an interest in sepsis at Aarhus University Hospital, Aarhus, Denmark.